Add egg and melted butter to the soured milk and whisk to mix. Pour wet ingredients into the dry and gently whisk by hand until flour is just incorporated. DO NOT over mix. If there are lumps, it’s okay. Just leave them. Gently fold in cranberries and zest. Let the batter sit, undisturbed for about 10 minutes. Do not stir it at all. Gently pour a ¼ cup of batter onto your frying pan or griddle. Heat butter over medium low heat in a small saucepan. Allow to melt and cook, stirring only occasionally to distribute heat. The butter will begin to bubble, this is the moisture escaping. Do not take you eyes off the butter as it cooks, it will begin to brown very soon. You’ll notice a very nutty aroma and small brown bits forming at the bottom of the pan. Stir those up a bit and remove butter from heat immediately. Transfer to a small bowl and set aside. In the same pan (no need to clean), add maple syrup and 3/4 cup cranberries. Heat over medium heat until mixture begins to simmer, about 5 minutes. Gently mash cranberries into syrup and add the remaining 1/4 cup of cranberries. Stir in the reserved brown butter and cook for another 3 minutes and transfer syrup to a pouring container. 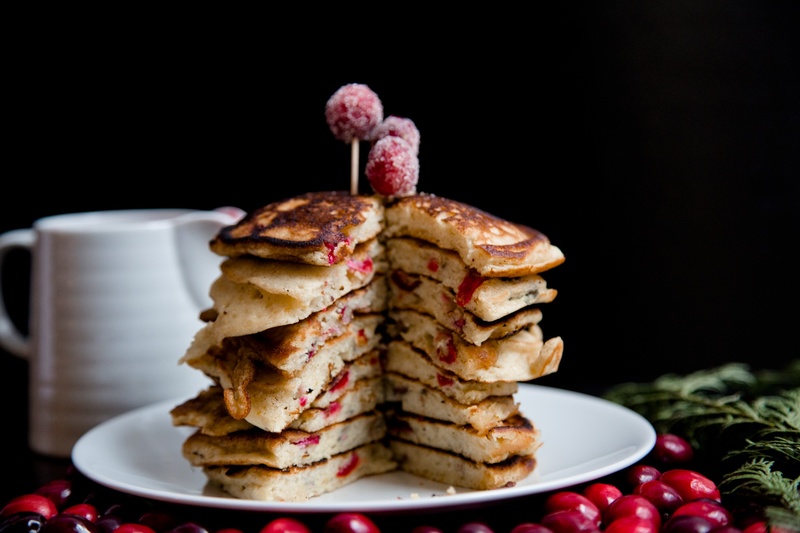 Canadian love pancake with maple syrup, but I love your version better with cranberries. Thank you for posting. Wow! Looks nice. Great for Christmas time. Is it ok to substitute the whole milk for low fat milk as I am on a diet? Or do you think that will completely change the taste? You can definitely substitute skim for whole. It shouldn’t change the taste too much :) Happy dieting and pancake eating! Never thought I would use the term ‘gorgeous’ for pancakes, but here I am! Need this NOW. Looks amazing!! Gosh, these pancakes look so scrummy! My mouth is watering so bad right now, must go and attempt to make some myself now! hmmm I’m not too sure about the marriage business.. but they do look delicious! I might add some whipped cream or ice cream I think! they look amazing, I’m definitely going to try them for a special breakfast.. Yes your should! Brown butter is so yummy and nutty. If you’re using butter anyway….might as well brown it! It adds so much flavor. Beautiful photos, makes me want to make them right away! 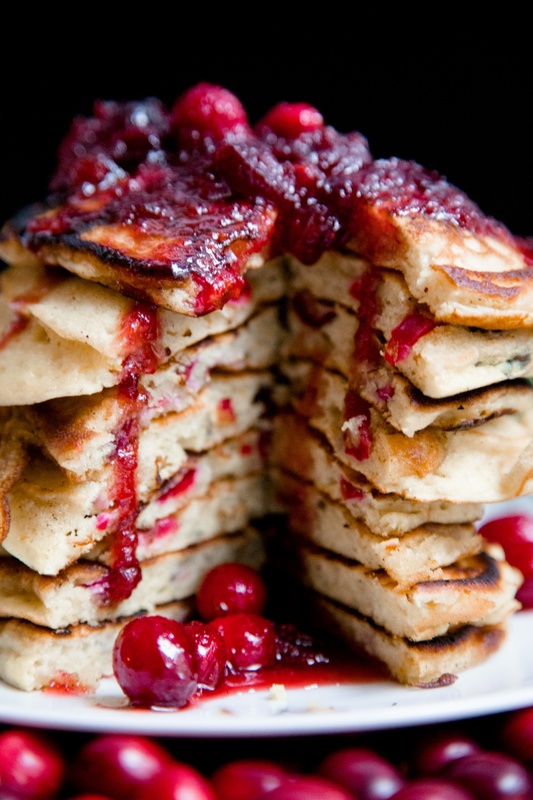 What a gorgeous and delicious stack of pancakes. So Christmasy and festive! Shut up! you just blew my pancake loving mind! I cant wait to get these puppies started! Wow. I don’t know about marrying those pancakes. Are they really the type you’d bring home to mama? I think we’d be two ships passing in the night … but definitely a tale to tell. Yours is the first blog I’ve ever hit “follow” before I ever read a word. I just saw the pancake picture. Does that make me shallow? I’m ok with that. Pass the syrup. Haha! Your comment made me laugh! I actually think these are the perfect pancakes to bring home to mama ;) And I’m honored that you’re following my blog (even if only for the photos :), thank you! My mom would find those pancakes a little on the saucy side. I’d content they’re just really, really sweet. Well, the photos got me in – the writing made me follow! I am generally the cook in the family but my husband is the pancake king. He makes pancakes EVERY Sunday for his girls and won’t even let me make flavor suggestions. (I have to admit he’s made some amazing flavors!) BUT….SYRUP I’m allowed to do. So I made your brown butter cranberry syrup this morning to go over hubby’s pancakes. It is SOO yummy!! A new seasonal favorite :) Thanks for a great recipe. Awesome!! I’m so glad you enjoyed it. It always makes me happy to hear readers are trying out and enjoying my recipes! xoxo! Lovely…and they’re so beautiful… :)Totally trying these guys out sometime soon! These pancakes look amazing! Totally will be try it at home!